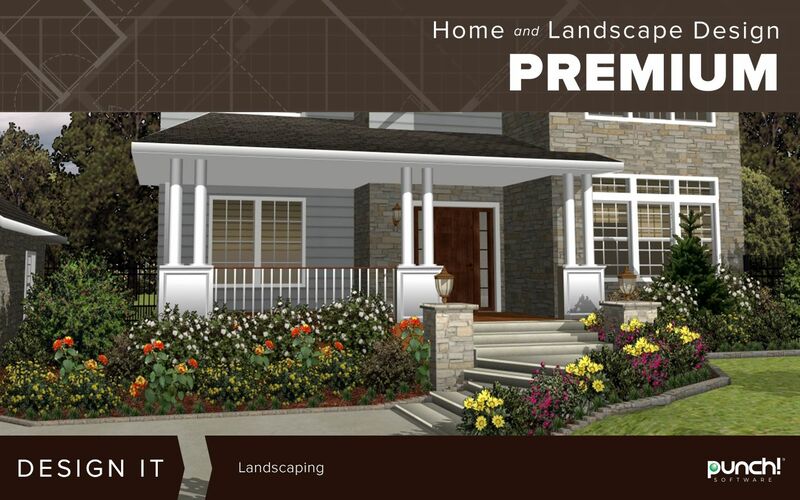 Planning your home and landscape design project has never been easier! Punch! 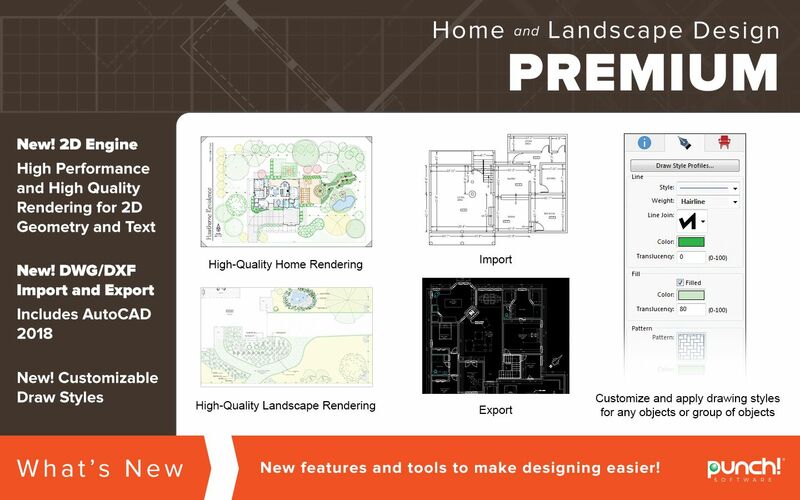 Home and Landscape Design Premium version 20 gives you the tools to bring your dream home to life. It's easy to get started with the QuickStart feature and drag-and-drop layouts. 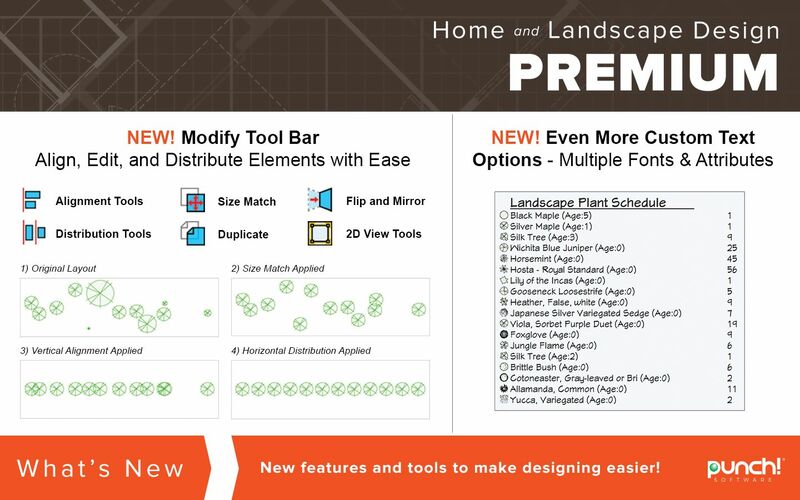 Build a project from a professionally designed floor plan or from scratch, add details with the full featured tool box and extensive library of name brand products, materials, and furnishings to complete your design. 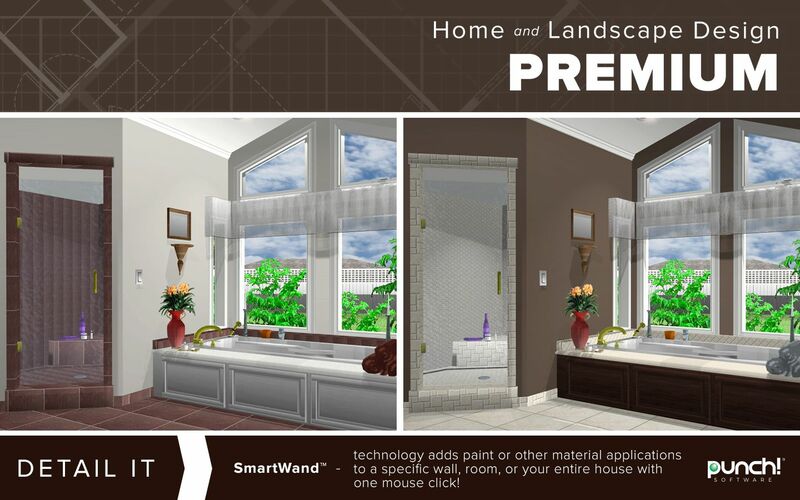 Whether you're working on a bathroom remodel or new construction, the Premium version has the tools you need! QuickStart: Drag & drop individual rooms to easily create your basic floor plan. 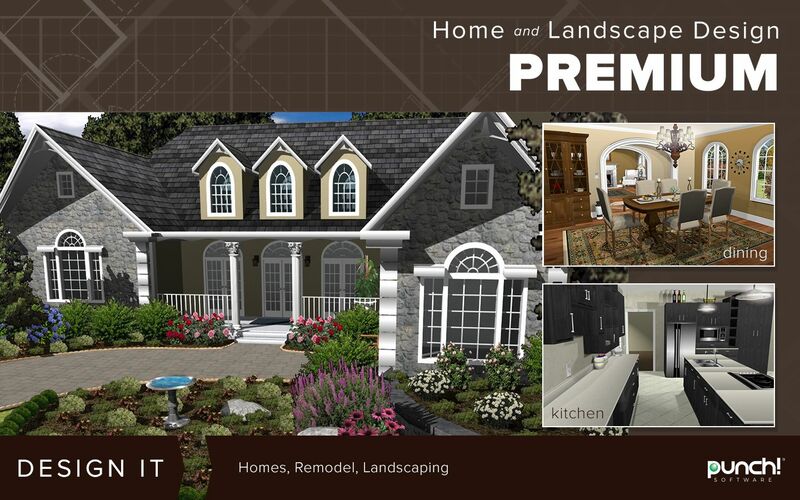 Professionally Designed Plans: Need inspiration or an instant starting point? Utilise our editable house plans to fast track your design or browse them for room layout ideas. Select metal, wood or custom framing options, including custom roofs, walls, and floor joists. Select from an extensive library of door and window styles. Customise the size, grille style, and other parameters to fit your plan. Add rooms and decorate with one mouse click! SmartWand™ technology adds paint or other material applications to a specific wall, room or you entire house with one mouse click. Object Library: Thousands of objects for every part of your design, inside or out. Remodel with new fixtures, lighting, ceiling fans, sinks, and more. Use as is or edit with 3D Custom Workshop™. Flooring Carpets & Rugs: Try tile, carpet, wood, stone, and other materials including brand name, real-world products. Furniture Showcase: Add predesigned furniture groups with simple drag & drop. Easily arrange or edit your selections to suit your design. Brand Name Product Libraries: Thousands of possibilities! Faux finishes, interior and exterior paint, wood floors, solid surfaces, blinds, stone, and much more. Nationally-recognised decorating materials you can try before you buy. Precision Lighting Planner: Add functionality and drama to your design. Works with exterior and interior designs. Precision controls for ambient light, shadows, fall off, radius, and more. Drag & Drop landscape light fixtures. Cabinet Designer: Customise your cabinets with shelving, pantries, drawers, and appliances. Also perfect for media centers, bathrooms and garage organisation. Storage Design: Gain more closet space by planning an inexpensive wire shelving system or lay out a garage that makes the best use of space, yet keeps things organised and within reach. Drag & drop shelving, workbenches and cabinets are included in the library. Planting Library: Includes a full selection of flowers, shrubs, and trees you can add to your design. You can also add your own favourite plants to the database! PlantFinder™ searches plants for your area, using parameters you specify, ensuring growing success. Sorting feature lets you select growing parameters, international zones, sunlight, climate, water, and soil conditions. Photo-realistic images of real-world plants that can be viewed from any angle. Colour-coded zone maps make plant selection easy and foolproof. Over 10,000 plants in 10 zones. Get complete information about every plant in the database with the Plant Details dialog. Plant Growth: Plan smart! Plan your design and see it grow over time. Perfect for previewing shade. Auto Edging & Planting Templates: Zone specific plant groupings with simple drag & drop placement. A variety of shapes for freestanding, corners, and more. Hardscapes: Build dramatic retaining walls that define and accent your home. Choose stone, brick, or other materials. Then add your plantings to finish the look. Outdoor Living: Turn a backyard outdoor entertaining space with included objects for kitchens, fireplaces, furniture and more. Add pavers, decks and landscaping to your design. Deck & Patio Templates: Predesigned, drag & drop, editable designs you can use as is or customise to your personal style! Administrator privileges are required to properly install the program on Windows® 7 or higher. User is responsible for all Internet access fees and phone charges.